Investors are looking anywhere and everywhere for the markets to give them some kind of clear signal… Should they go back to being bullish, or hedge against a bear market taking over this year? Guessing which direction the economy will head towards right now could lead investors around in circles with no more certainty than they began with. Instead, it may be more useful to pick up a stock built for uncertain markets and showing signs of price uplift. When in doubt, large-cap defensive stocks are hard to beat for stable earnings and minimal risk. For investors, one well-known portfolio staple is showing an upward momentum trend that could boost returns while providing an ample defense against economic downturns. The Procter and Gamble Company (PG) is a $235 billion consumer goods conglomerate that produces a wide range of personal health, hygiene, home care, and other consumer products. The company sold off a large segment of its business in 2014, streamlining efficiency and focusing more on its remaining 65 brands. The company reported a 2nd quarter earnings beat of $1.25 per share compared to analyst’s estimates of $1.21 per share. The most impressive part of the beat wasn’t the number, but rather the fact that Procter and Gamble beat estimates despite raising prices during the quarter to adjust for higher transportation costs which essentially amounted to no net loss for the company. The growth potential of the stock has begun to be noticed by Wall Street as well with Berenberg upgrading its rating from “sell” to “hold” earlier this month. This stock trades slightly under the industry average at 21 times earnings compared to 23 times earnings but has a much higher estimated long-term EPS growth rate than its peers. The beta of the stock is just 0.35 as well, making it slow to adjust to market changes – a positive statistic in uncertain markets. Procter and Gamble also comes with a hefty 3.10% dividend yield providing stable income to investors while protecting against downside stock movements. The company has a long history of consistent dividend payments as well and currently has a payout ratio of 67% leaving plenty of room for increases down the road. Over the past 12 months, the stock has put up a modest gain of just 6%, but appears to be building up positive momentum over the past few weeks. The stock has accelerated above the 90-day and 20-day simple moving average on high trading volumes indicating the start of a new bullish trend. If it continues, the stock should break out and hit a new 52-week high. Based on Procter and Gamble’s full-year EPS estimates, this stock should be fairly valued at around $105 per share – a gain of more than 15% with the dividend yield included. The building momentum combined with its long history of faithful dividends and returns makes Procter and Gamble the ideal anchor stock for your portfolio as we head deeper into what promises to be a volatile trading year. MarketClub’s technology confirms Mr. Cross’s analysis that PG has a sturdy uptrend in place. With a Chart Analysis Score of +85 and green long-term and intermediate-term Trade Triangles, we believe that PG should continue its upward trajectory. Members following our long-term Trade Triangle strategy would have entered a long position on July 6, 2018, and as of the open on January 29, 2019, and are tracking an 18% gain. Members, you can add PG to your watchlist and set your alert so you’ll know the second our technology detects any weakness in the trend for this stock. Not a member? 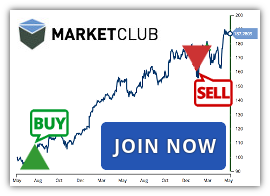 Get exclusive analysis and signals for Proctor & Gamble (PG) or over 320K symbols when you try MarketClub for 30 days.